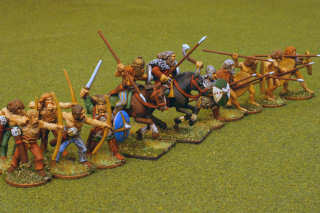 This page describes a ancient German warband used for miniatures wargaming.I have taken twelve models from Wargames Foundryand painted them for skirmish wargaming usingTod Kershner's Pig Wars rules.My Pillage the Village scenario rules requireexactly twelve figures for raiding an unsuspecting village. For the Pillage the Village game, these menare fully armored.The king and his son have veteran morale.They are mounted with spears, so they get a +1 mounted bonus against foot soldiers.It will be cool to ride the horses into churches and hovels, terrorizing theinhabitants.The two models are taken from Foundry's Chatti and Suebi cavalry (AG10 and AG6) packs.The foot soldiers are also veteran morale with full armor.The horned helmet warrior is from Celtic personalities pack CB1.The bearded ax warrior is from Franks and Saxons noble warriors pack AFS5. Do the foot soldiers look right? They look more Celtic than Germanic to me. 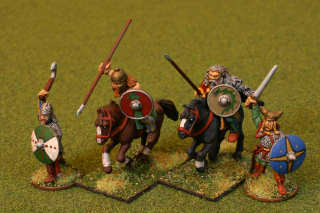 Perhapsthey are leftover Haltstadt or Beaker celts from an earlier age.I think they look fine as long as you are modeling Germans from the lower Rhine and Danubewho were Celtic in origin.The Germans from the north were more Scandanavic in origin.In general these Germans are useful from about 100 B.C. to about 500 A.D. 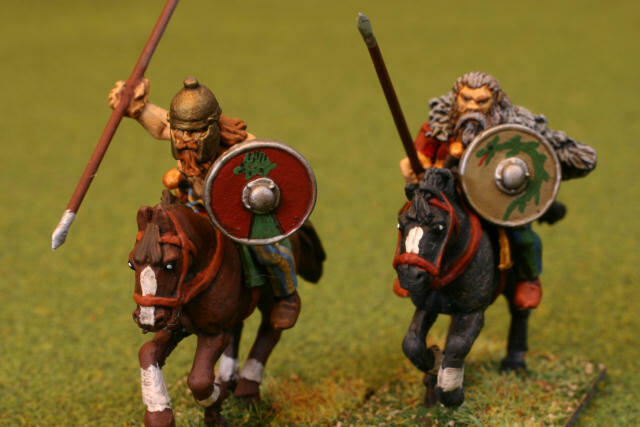 Here is a close up of the two mounted Germanic warriors.I bought them while I was on a trip and attempted to paint them and use themin the same day I bought them.My friend Dave helped me paint them up. Although the first paint job looked good for a rush job, I decided to redo them.I soaked them in acetone overnight and all the paint immediately came off.Then I reprimed them and painted them as best as I know how. 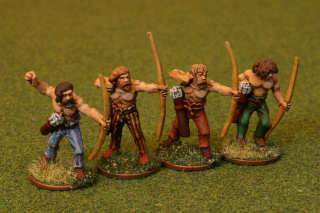 Here are a group of ancient German bowmen.Germans of this timeframe liked fancy textiles, so I painted stripes on the pants.Also, while most of the southern world was wearing tunics and most of the northern word waswearing cloaks and tunics, the Germans most likely invented pants as we know them.Here are a bunch of German bowmen wearing sporty pants. Two of the Germans have pulled their hair to the side and tied it in a knot.This is known as the Suebian knot as that Germanic tribe used it alot.The bowman to the far left looks noticably younger than the others.He sports a shaggy hairdo much like what I wore in high school and college. 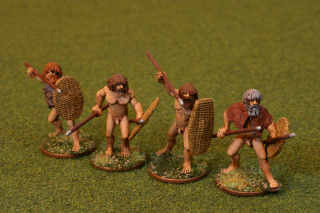 To the left are 4 German wildmen.I wonder if any web searches for "Naked German Wildmen" with other intentions will lead to this page?They are from Foundry pack "Savage German Warriors" AG18.I like the wicker shields and added the multiple javelins.For the Pillage the Village game, these menare unarmored with spears and shields. Morale is average. 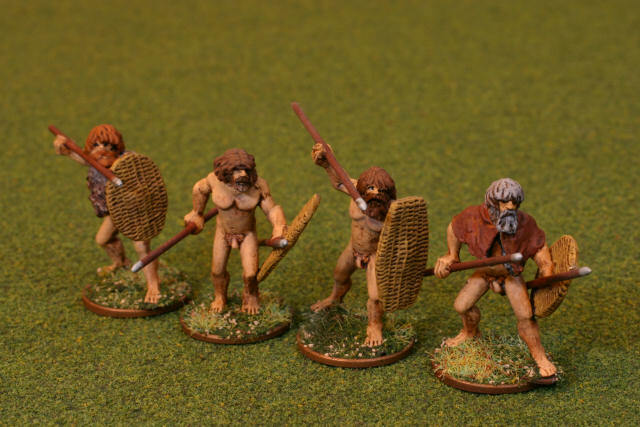 It is interesting to see a sculpt of the naked, nearly-unadorned human form in 28mm,free from clothing and other accouterments that might hide bad proportions, lumpy musclature,or other problems.I think these sculpts, warriors obviously in great shape, are very well proportioned and realistic. 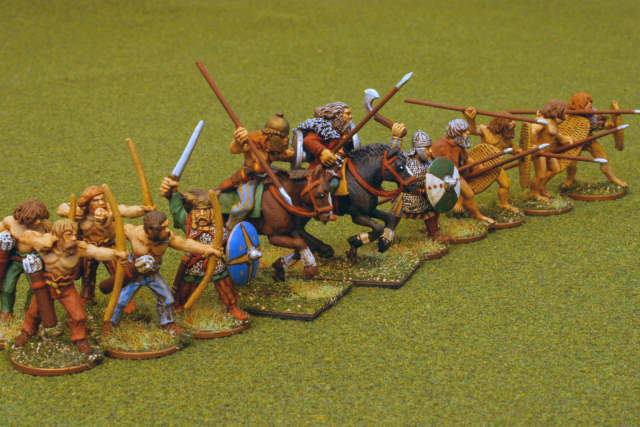 Here we see the entire warband in a charge.What Roman legion awaits their attack?What neighboring tribe or village will be devastated by their sudden plunder? Last modified: Thursday, 09-Jun-2011 12:38:18 MST.